Inspired by the magnificent view from the 30th floor auditorium at the Delta Lloyd Mondriaantoren, SourcingExchange made a new step on Wednesday, hosting its first onsite event on ‘Innovation Sourcing’. Alexander Dortland (pictured left), Founder and Initiator of the organization unveiled the SourcingExchange MarketConsultation and ‘Innovation Sourcing’ propositions affirming the pathway for 2015. 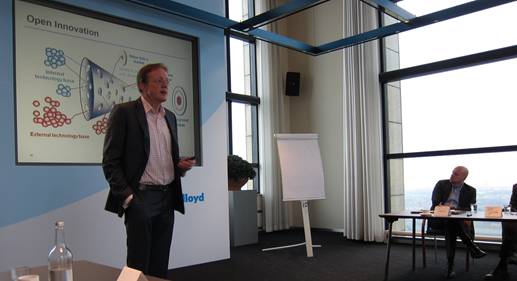 The event is hosted by Delta Lloyd, a large Dutch insurer which has recently completed a series of innovative projects to develop products that are tailored to fit customer needs, and are investing in knowledge and innovation making their business more sustainable. Pascal Huijbers (pictured right below), Chief Technology Officer at Delta Lloyd welcomed the audience, introducing Delta Lloyd and some recent examples. The learning event consists of a series of presentations and panel discussions. The presentations were opened by Alexander Dortland who introduced the concept and business model of SourcingExchange and elaborated on the recent history of open innovation models. “The SourcingExchange Innovation Sourcing proposition is based on recent insights in open innovation business model theory”, he said. “We are building on research from the Innovation Sourcing PhD project which is conducted by Bart van der Linden at Nijenrode University. Recently, Bart joined SourcingExchange as our community manager. We are proud to have him in our team and heading our circle of interest on Innovation.” Bart’s research has resulted in a meta-model for Sourcing IT-related Innovation. Depending on a number of variables, such as organization culture and scope of innovation, various innovation models result. Alexander also stressed the fact that organizations who are successful at Innovation best practices show significantly more output and earnings from their innovation efforts. A recent study has shown a significant performance spread across industries and an average of 13% points more EBIT from new products and services for top innovators. Paul van Wijngaarden, Business acceleration consultant WhiteBridge Consulting, included the today’s world by discussing 4 recent examples of his innovation experience. Each of these examples illustrated a different approach to innovation in sourcing relationships, varying from innovation days on an offsite location to an in-house test-location for presenting and evaluating new solutions for a large retail organization. Paul illustrated several differentiators. These are: the ‘part of the organization which takes the initiative for innovation’ and the ‘nature of innovation, being either ad hoc and radical or structured and more incremental.” He concluded that although the academic models describe how innovation in partnerships can be executed, in reality real innovation does not come easy. But when technology is the driver of the innovation, joint development of the business solution between the IT departments, business functions and technology supplier is indeed feasible. The premises are a sound foundation for innovation, customer focused use of new technologies and an innovation driven culture. After the break Jeroen Kleinhoven (pictured below-right), partner at CIO-net and CEO at Treparel, welcomed Iason Onassis, Senior Director of Innovation Consulting at Philips. 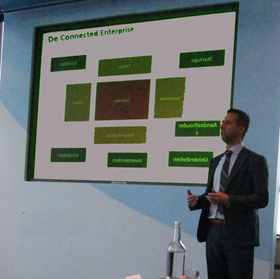 Iason heads the Innovation Consulting team within the Philips Industry Consulting unit. 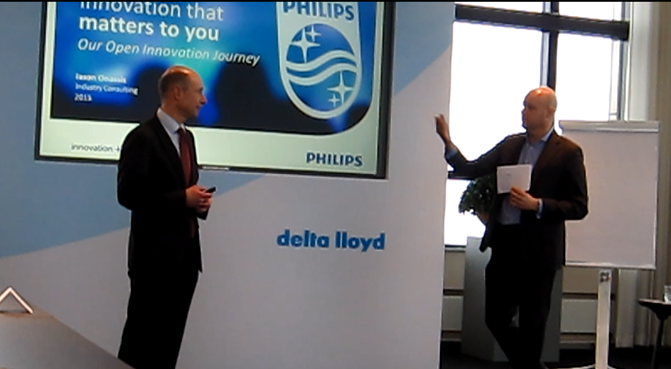 He explained that Philips has a longtime trackrecord of inventions and innovations, but has decided for a radical shift towards open innovation. This has resulted in a flow of inspiration, creativity and innovations on the open innovation and business campus which was opened in 2012. “Adopting open innovation has not been an isolated decision, it was a process that grew over time and at each step along the way we experimented.”, said Onassis. “Open Innovation is not a goal in itself, it is an important enabler to accelerate innovation. It helps finding better solutions quicker”.